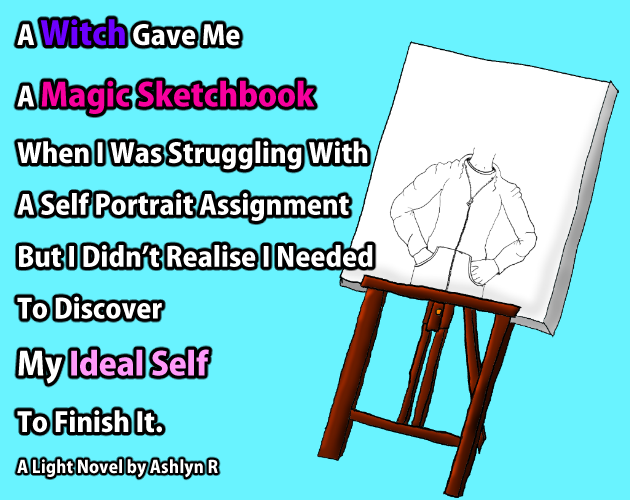 "A Witch gave me a magic sketchbook when I was struggling with a self portrait assignment but I didn’t realise I needed to discover my ideal self to finish it." 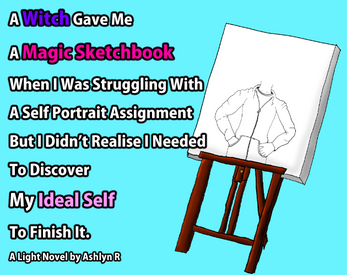 This is my first light novel I have written and it comes from the heart. I’ve tried to convey some of my trans experience, feelings, experiences of gender dysphoria, repressing, gender euphoria and affection in this hopefully lighthearted medium. It is a story of self discovery, change and realising everything you were too afraid to admit you ever wanted. Sometimes all you need are friends and a little magic. Both writing this and doing the illustrations has been a learning experience and I’ve grown much over the course of this. I hope you enjoy reading this as much as I did writing it and experience lots of gender feels. Short title: Self Portrait. Self Discovery. Depictions of Gender Dysphoria, Depression. Food, cats, bats, witches, magic, demons, transformations, non-sexual intimacy, university, clothes shopping. Story is 10 chapters + 2 epilogues long, ~10,000 words and 8 Illustrations.